Henriette Lersch is a violinmaker in Vienna, Austria. With her workshop in Vienna, she is able to work in a city with a long tradition of classical music in ten professional orchestras and several music colleges. She started her training as a violinmaker in 1994 at the violinmaking school Antontio Stradivari in Cremona, Italy. She was then offered an apprenticeship and continued in the workshop of Hartmut Münzberg and Walter Waidosch in Heiligenberg, Lower Bavaria. During her apprenticeship she mainly built historic instruments. The first stringed instrument she made was a viola da gamba, a six-stringed Baroque instrument she made while taking a course for amateur violinmakers that took place in a medieval castle in Germany. In the years that followed, she focused on restoring and maintaining modern instruments, working for C. Arnold in Darmstadt and working for four years for Stam & Zoon in Utrecht, NL, where she also did a lot of bow rehairs. 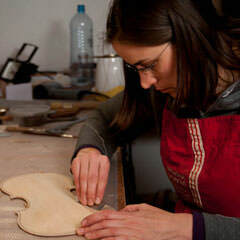 In 2005 Lersch started focusing again on the construction of instruments and took her master violinmaker exam at the Viennese Association of Instrument Makers. In 2006 and 2007 she worked for Christophe Landon rare violins in New York, where she did extensive restorations on valuable antique instruments and worked on exquisite bows. Inspired by old Iitalian instruments and the productive atmosphere in C. Landon's workshop, she also built some instruments. Lersch also worked with the Art History Museum of Vienna, Violinmakers Without Borders in Havana, Cuba. This page was last edited on 29 October 2016, at 14:10.